At the end of this month a career of service to Nuu-chah-nulth concludes, spanning a 34-year period that saw the tribal council transform from a political advocacy organization to one of the widest reaching service providers in the region. Simon Read, the Nuu-chah-nulth Tribal Council’s director of health, retires from his post on Jan. 31, leaving behind volumes of policy development, advocacy and service implementation for the people who call the west coast of Vancouver Island their ancestral home. Read joined the NTC as tribal planner at the end of 1984, stepping into a world of outspoken Nuu-chah-nulth leaders who left legacies of being highly vocal advocates for their people. 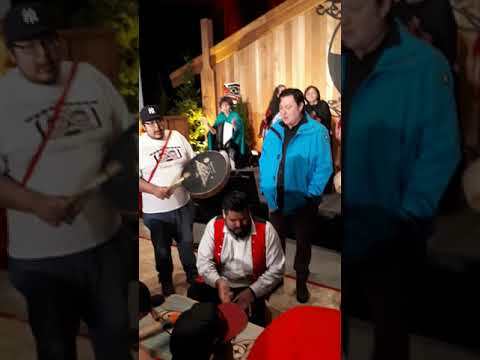 By contrast Read held his role with a characteristically soft-spoken manner, precise in his communication while steadfastly focusing on how to improve the lives of Nuu-chah-nulth-aht. Geraldine Edgar-Tom, a cultural support worker with Teechuktl Mental Health, remembers working with Read in the mid-1980s when she represented health interests for the Nitinaht (now Ditidaht) First Nation on a committee. At the age of 32, Read came to the NTC with consulting experience from government, corporations and First Nations contracts. But it was with Indigenous communities that Read wanted to employ his skills. “I felt more valued in doing that work,” said Read, who mostly grew up in Coquitlam, B.C. In 1984 the NTC employed just under 20 personnel, but this was destined to change after a motion was passed by chiefs three years earlier for the organization to take over health services from the federal government, as well as child welfare. The health services transfer finally occurred in 1988, after Read transitioned to be the NTC’s health coordinator, and the establishment of Usma Nuu-chah-nulth Family and Child Services would follow. The number of registered NTC members has also changed over Read’s 34-year term. In the mid-1980s there were approximately 4,000, a number that has grown to 10,000 among 14 bands. To serve this growing population the NTC has increased its workforce tenfold to almost 200 staff in multiple offices from Port Alberni to Gold River. This includes nearly 70 staff involved in health services. Over his term Read has seen health condition improve among many Nuu-chah-nulth people, although in some ways dangers have also increased. His time at the NTC also grew into a family for Read, who first met his future wife Brenda Lauder at a tribal council meeting before taking on his position. They ended up having three children.